Explore the remote and mysterious Kingdom of Bhutan by running their annual international marathon. Taking place in March 2018, choose from the full or half marathon that takes you through the Khamsum Yulley Temple, monasteries, rice paddies, rainforest, villages and Chortens, and finishes in the historic Punakha Dzong, aka. “The Palace of Bliss’. All profits from the marathon will support Bhutan’s Youth and Olympic Sports program, so you can make sure your miles go towards a meaningful cause. Not many people know that North Korea has been running the Pyongyang marathon since 1981. This will only be the fifth year that the marathon is open to foreign amateur runners, with options for 5km, 10km, half- and full marathon distances. All non-Korean runners must enter the country as part of an organised tour group (Koryo Tours is their preferred travel partner), and the route will have you passing by many of the country’s most iconic buildings. All races will start and finish at the Kim Il Sung Stadium, where a 50,000-strong crowd of local Koreans will be waiting to cheer you on. Here's one for late-risers. Instead of starting at the break of dawn, and sometimes before, the Sundown Marathon Singapore is actually one of the few night races in Asia. The course starts from the F1 pit at Marina Bay Sands and takes you all over Singapore's brightly-lit night scene. Having started in 2008, the organisers are expecting 30,000 runners this year. Distances range from 5km and 10km (individual or teams of four) to both half and full marathons. Widely considered one of the world’s most challenging marathons, the Great Wall Marathon attracts around 2,500 runners from over 50 nations each year. Available in 8.5km, half-marathon and marathon routes, the running route starts and finishes at Yin and Yang square in the old Huangyaguan fortress, passing through various villages, small towns and parts of the Great Wall itself. Be prepared to crawl your way to the finish line. Calling itself “the highest and most adventurous marathon in the world”, the Tenzing Hillary Everest Marathon starts at the Mt. Everest base camp (5,356 metres) and ends at Namche Bazar. Named after the late Tenzing Norgay Sherpa and Sir Edmund Hillary, the race track passes through their historical route and is mostly downhill. The route takes runners through the rhododendron forest, wild orchid grove and the world-renowned heritage site, Tengboche Monastery. Other race distances include the Extreme Ultra (60km) and the Half Marathon (21km), but the event is also open to non-runners. Taking place over two days, the Laguna Phuket Marathon will celebrate its 13th year in 2018 with an expected 8,000 runners covering 2km, 5km, 10.5km, half- and full marathon distances. Starting with a legendary pre-race pasta party on the eve of the marathon, the sun- and fun-filled event also features an expo showcasing the latest goods from various sports brands. Held around Hovsgol National Park and its pristine alpine lake, the Mongolia Sunrise to Sunset Marathon offers 42km and 100km distances for nature-loving runners. The course takes you through river valleys, mossy forests and dirt trails with the chance of encountering reindeer-herding locals, wild sheep, bear and moose, plus over 200 species of birds. Runners will be based at Camp Toilogt, featuring rustic Mongolian-style living with environmentally-friendly “Western” comforts including hot showers, solar electricity and a satellite phone. Combined sightseeing travel packages are available with activities like horse riding, trekking, kayaking and fishing. The event is not-for-profit and all proceeds go towards preserving the Hovsgol National Park and other parks in Mongolia. Explore the ruins of Cambodia’s world-famous ancient city and UNESCO World Heritage Site, Angkor Wat, at the fifth Angkor Empire marathon in August. The run starts and finishes at Angkor Wat, with shorter distances of three and 10.5 km available to cater to all levels of runners. Temperatures at that time of year will be in the 30s so be prepared to sweat. In December, Angkor Wat hosts another international half marathon that raises funds for landmine victims. Fees from that event go towards prosthetic limbs, social reintegration and other educational programs such as the education and prevention of HIV/AIDS. If you’re up for a challenge, head to North Vietnam (Sapa) for the Vietnam Mountain Marathon, a trail running race available in distances of 10, 15, 21, 42, 70 or 100km. 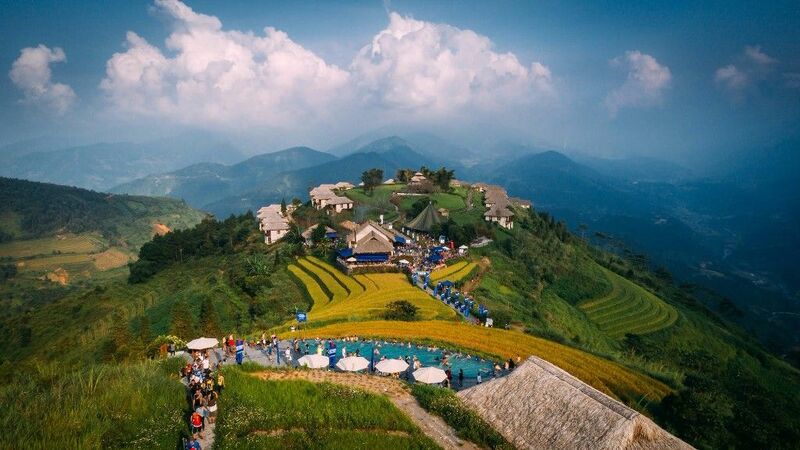 You’ll be running by yellow rice fields, water buffaloes and colourful ethnic minority groups, using roads and trails used only by the villagers, giving you an authentic and rare glimpse into local life in the area. The organisers warn of very strong sun or heavy rain, and all runners must sign waivers to participate, given the high altitude and challenging conditions of the race (first-time marathoners and ultra-marathoners are now allowed). If you make it to the end, you’ll be rewarded by a bonfire dinner with other mountain runners under the star-filled night sky, with memories to last a lifetime. Go back in time to Myanmar’s own temple wonderland at the Bagan Temple Marathon on November 24th. The marathon starts and finishes at Htilominlo Temple, a structure from 1211 known for its fine plaster carvings, taking runners through the plains of Bagan towards Old Bagan with views of hundreds of mystical temples and pagodas. A mix of dirt roads and asphalt, the race caters to 10km, half- and full marathon runners, and is expected to be hot and humid with temperatures reaching highs of 30 degrees Celsius.